It’s time again for another Iceland Affair. 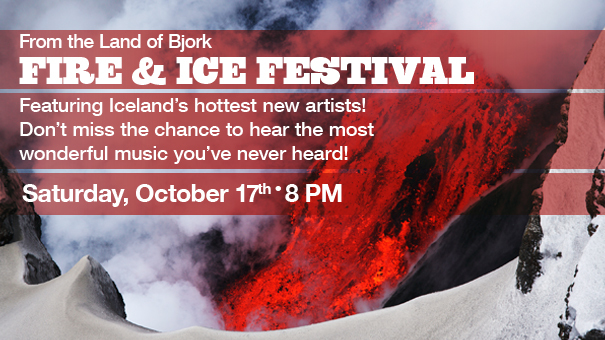 This charming Icelandic festival celebrates it’s sixth year on Saturday October 17th. Nestled in the picturesque towns of Winchester and Norfolk CT, Iceland affair will take over the Winchester center and Infinity Hall for cultural presentations, unique items for sale, food, and a night of music. During the day Winchester center will play host to multiple presentations, Icelandic horses, food and merchandise. there will be a silent auction table as well as a slew of products from Lopapeysas (Icelandic sweaters), cakes, soaps and other Icelandic items for sale throughout the event. There will be Pylsur (Icelandic Hot-dogs) on site, and their free! They are the best hot dogs you will ever have, in my opinion. Nighttime will bring the Fire and Ice concert. A cozy evening with 5 fantastic Icelandic artists at the Infinity hall in Norfolk, CT. The artists tend to play together and interact with the crowd making it a rather unique and intimate night of great music, laughter and fun for both the artists and audience. Kristjana Stefánsdóttir, Svavar Knútur, Sóley, Björn Thoroddsen and Myrra Rós will be gracing the stage this year, all of them veterans of the festival. Most everyone playing has new material or albums that have been released recently, so I’m envisioning a lot of fresh material will be performed. The festival typically sells out, and with less than half tickets left I would suggest getting them sooner than later. Along with the the bands, there are always surprises that pop up during the concert. Kristjana Stefánsdóttir has been a vocal coach to many Icelandic singers over the years. her command of Jazz is rivaled only by her smooth and strong voice. No matter what or how she’s singing it’s rare not to be completely sucked in to her songs. Svavar Knútur is a riot, he not only entertains with great music, but his personality and ability to naturally engage the audience makes for a good time for everyone. He has a new album out, and so there will be plenty of new material to enjoy. Sóley has been touring all over, but this will be only one of the few times we on the East coast get to see her this year. Her new album was so impressive I actually attempted a review on it. And I can’t wait to hear the new stuff live. Björn Thoroddsen is a magic man with a guitar, and always puts on a good show with original or highly improvised versions of classic tracks. Not only does he command complete attention when he’s center stage, but he has this amazing ability to play back up for anyone at any time and not miss a beat. He never disappoints. And Myrra Rós, with her haunting vocals and up-beat melodies are just right for an autumn concert. her new album, “One amongst others” was just released and I really enjoy it. I can’t wait to hear some of the new material live. So come get a hot dog, learn about Icelandic culture, and spend the night being entertained by an extremely engaging group of musicians. This entry was posted in Uncategorized and tagged Bambaló, bjorn thoroddsen, connecticut, culture, electronic, festival, iceland affair, icelandic, infinity hall, kristjana stefansdottir, Music, myrra ros, norfolk, soley, soley stefansdottir, svavar knutur, winchester on October 11, 2015 by ragnaarbastiaan. It’s been 4 years since Sóley’s last full-length album, and as they say good things come to those who wait. Sóley Stefánsdóttir, of Seabear and her own fame has delivered one hell of a finely crafted piece of art with the new album Ask the Deep. While We sink‘ was dark, Ask the Deep goes further down the rabbit hole. An internal argument of staying with or leaving devils. Multiple layers of tribal-like percussion, floating synth, and cascading keys weave a sophisticated and emotional dance creating the perfect background to Sóley’s haunting and rhythmic vocals. I honestly feel you’d be hard pressed to find such sweet serenades about devils, darkness, and despair anywhere else. Each listen I give this album brings out a new emphasis in both the instrumental and wording in the songs. I’ve given it enough listens to safely say it’s far from getting old, this is definitely one of my favorite albums of the year. The album starts off with the track, ‘Devil’ where Sóley asks if she’s danced with devil, and does he still love her? A person realizing a personal struggle, or perhaps someone they care about, may be harming them but they’re afraid to live without them. As the album progresses, it becomes less about how the devil feels and more how the chanteuse realizes her own power and self-worth. By ‘I will never’ we realize she’s made it through the muck and mire and has come out stronger and standing tall leading into an almost euphoric, cloud clearing/sun shining ‘dreamers’, the most upbeat song on the album. The album ends with ‘Lost ship’, a final contemplation and realization that letting go will make her responsible for her own life, and is she willing to let the devil go to do so. You can follow Sóley on Facebook, and on her website. She is touring, see her schedule here. And she will be in the United States in October for Iceland Affair up in Connecticut. This entry was posted in Uncategorized and tagged ask the deep, band, best of iceland, Iceland, iceland affair, Music, music review, new album, Review, soley, stefansdottir, top 15, top album of year, top icelandic band on July 12, 2015 by ragnaarbastiaan.